It's a good idea to have a basic understanding of how camera meters work. 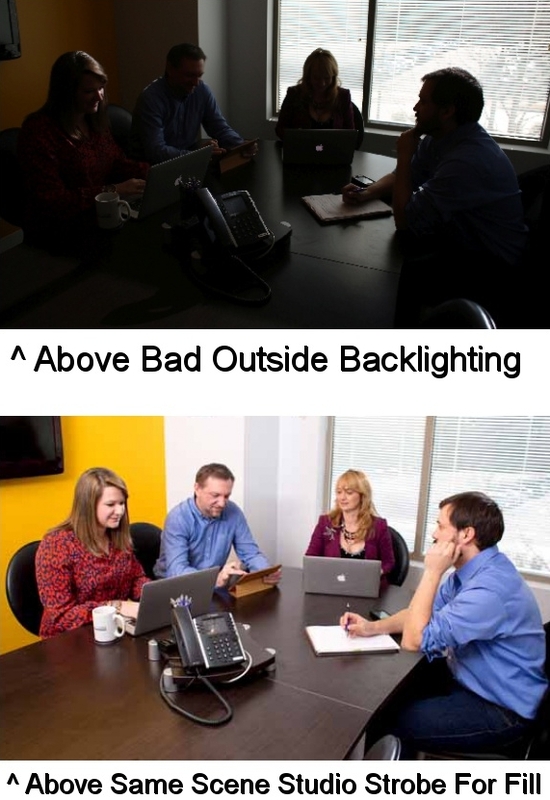 In the example above, the meter exposed for the outside which as you can see by the backlight from the window it caused the subjects to be blacked out. Assuming you want to keep the window behind the subjects, the other option would be to expose for the inside, but then the window would be overly bright and blown out. So what I did in this case was use a studio strobe to light the room which lit the subjects and got them out of shadow. It's the same setting as the first image, but with the studio strobe being used as a fill light, the problem got solved. On a smaller scale, if you had no choice but to stand your subject in a situation inside or outside with strong backlighting, you could use a flash on your camera to cause the subject to be lit up. These shots can actually be nice with the sun behind the subject and proper lighting with a flash from the front.